Chinese prosecutors in the port city of Tianjin have indicted the Chinese Communist Party’s former security chief, the grim-looking Zhou Yongkang, on charges of bribery, abuse of power, and leaking state secrets, according to official media. The announcement was made on Friday morning, local time, accompanied by a barrage of damning analysis through official and semi-official media channels, which went on at length about Zhou’s malfeasance, and the network of corruption that he cultivated. Zhou’s downfall had long been suspected. In early 2012, when former Politburo member Bo Xilai was felled, the purge that later reached Zhou had already been set in motion. Zhou was a key ally and protege of previous Party leader Jiang Zemin. Zhou helped Jiang maintain enormous influence in Party affairs for years after Jiang’s official retirement in 2002. He is also accused of conspiring with Bo Xilai in what amounted an attempted coup on the incoming leadership, which took place in late 2012. Word of the conspiracy between Bo and Zhou emerged in 2012, but it was not until recent months that such information began appearing in mainland Chinese press accounts. Zhou Yongkang was useful as part of Jiang’s political clique because of his eagerness to implement the latter’s pet political campaign, the persecution of the Falun Gong spiritual discipline, which Jiang initiated in 1999. The Party’s investigative apparatus only appeared to make public moves against Zhou slowly, around a year after he left office in late 2012. First, his former comrades in the regime and in the petroleum sector were encircled. Zhou once headed the state-owned China National Petroleum Corporation. Then his son came under fire. Finally, in late 2013, it was announced that Zhou himself was under investigation. The recent news means that Party investigators have finished with their portion of the process and are now transferring him to the judiciary for prosecution, in what are sure to be kangaroo court proceedings. Zhou Yongkang is a former member of the Party’s Politiburo Standing Committee, the highest decision-making body in the country. As a member of that committee, his brief was to oversee the Party’s expansive security apparatus. It commanded a budget larger than that of the military, and encompassed the police, including the armed and political police, prisons, labor camps, re-education centers, and the court system that Zhou is now at the mercy of. That Zhou Yongkang is guilty was decided long ago. Now the decision makers in the Chinese Communist Party must decide what crime he is guilty of. Chinese state media announced Dec. 5 that the Party’s former security czar Zhou Yongkang was expelled from the Chinese Communist Party. 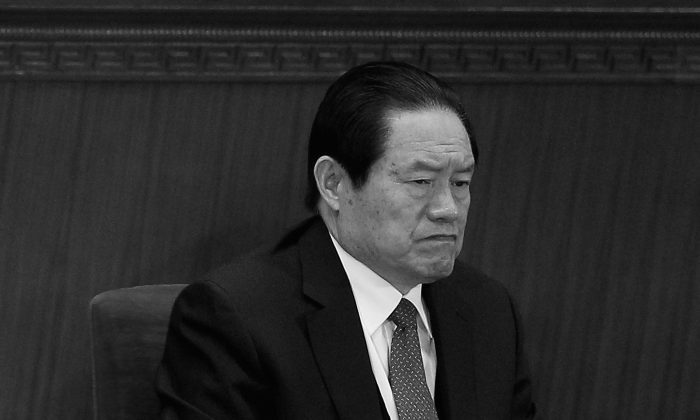 The Chinese regime wanted to build a case against Zhou Yongkang. During investigations, they got more than they bargained for.